I've changed from being very self conscious about my smile to thinking it's one of my nicest features - and I have Jeanie to thank for that. I'd recommend an Inman Aligner to anybody. Crooked teeth are straightened by the use of special devices and techniques [orthodontics]. ‘Braces’ is an umbrella term for devices which are specifically used to move the position of teeth until they are aligned. People may want to straighten their teeth for functional reasons i.e. they cannot bite properly, clean their teeth adequately etc. or because they are unhappy with the appearance of their teeth. Orthodontic treatment can be carried out by a general dentist if the case is simple. For instance just moving the front teeth or cases where the only concern is the cosmetic result tend to be more straightforward cases. Where the problem is more functional and the bite requires aligning leads to the case becoming more complex and often such cases will need to be referred to an orthodontist (a dentist who specialises in moving and re-aligning teeth). Children are most commonly referred to an orthodontist, typically between the ages of 10-14. The orthodontist will need to know what concerns the patient have about the position of their teeth and will often take x-rays and moulds of the teeth. The orthodontist will then formulate a treatment plan and explain this to the patient. Options will be discussed as well as any potential problems and/or limitations with the proposed treatment. Baby teeth – Occasionally baby teeth are retained for longer than they should be and cause delayed eruption of the adult teeth. Generally orthodontic treatment cannot be started until all the adult teeth are present. Adult (permanent) teeth –Sometimes adult teeth require extraction if the mouth is too heavily crowded. Modern orthodontics is moving away from this and the decision to remove teeth is never taken without alternatives being explored. In certain situations minute amounts of enamel can be removed from teeth from in between teeth (via a process called enamel stripping) to create enough space for teeth to be adequately moved. Usually orthodontics is only commenced once all the baby teeth have been shed. Orthodontic appliances will not be fitted if the general health of the mouth is not excellent. Braces often make it difficult to clean the mouth and may exacerbate any existing problems. This is why a general dental examination is required before any orthodontic treatment is commenced. Orthodontic treatment (especially on the NHS) will typically have a long waiting period before a patient can be seen. 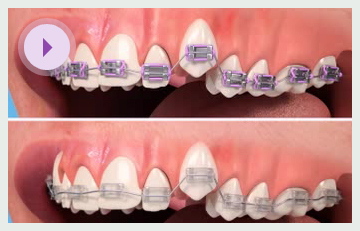 Fixed braces – These are individually fixed to the teeth with a type of resin and are consequently fixed to the teeth. They cannot be removed to be cleaned. This type of brace is used when the teeth are very crooked and offers the best results. Some patients (especially children) like to choose different colours on the brace to make them trendier, eg the colours of their favourite football team. 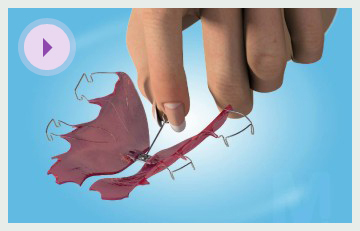 Clear brackets and wires are available which are less noticeable. 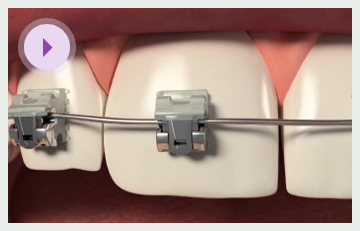 Removable braces – They are very useful at moving either individual or groups of teeth, for example for correcting a deep bite or widening a narrow upper jaw. They are often used when the patient is younger and still growing and can be used occasionally when baby teeth are still present. This type of treatment usually precedes fixed brace treatment. Removable braces are easier to keep clean, however if they are removed too regularly the teeth will not move as quickly. Invisible braces are one of a whole new generation of orthodontic appliances which are an alternative to conventional braces. Another example is the Inman aligner. The Inman aligner is a removable appliance which can move teeth very quickly. Clear aligners/invisible braces are a system where a series of clear and rigid gum shields are used to slowly move teeth into the correct position. Both of these new systems are very good for correcting the position of the front teeth. The Inman aligner tends to move teeth more quickly but the clear aligner-style system is a more aesthetic option. If you are uncertain which type of treatment is appropriate for you we would be delighted to speak to you about it at Westdene. The complexity of the problem. For instance teeth which have not erupted into the mouth correctly can take up to two years to move. Generally orthodontic treatment is not painful although the patient may feel a degree of discomfort initially until the braces are ‘bedded in’. Once the brace (fixed or removable) has been fitted a patient will need to visit the dentist/orthodontist to assess the movement of the teeth and state of the orthodontic appliance. It is very important that general dental check-ups are maintained during orthodontic treatment as the occurrence of other dental problems may affect the success of the orthodontic treatment. Good oral hygiene is integral to any successful orthodontic treatment. Your dentist/orthodontist or hygienist will instruct you about what is the best way to keep your brace clean.